Italian cuisine is known across the world for its simple and awesome taste. Most of our favourite dishes like Pastas, Pizzas, Espresso, Tiramisu, cheese etc. have their origins in Italy. The major reason behind this vast growing popularity of Italian cuisine is its taste which is a perfect blend of flavours that is not over the top, yet mild and delicious. 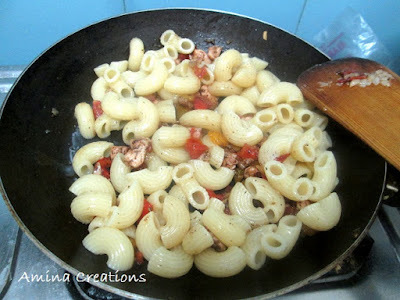 Italians prefer simple cooking to elaborate preparations and hence most Italian dishes are cooked with few ingredients. Olive oil, bell peppers, different types of cheese, potatoes, pesto, onions, rosemary, thyme are some of the common ingredients used in Italian cuisine. The one brand that is synonymous with Italian food is the Del Monte brand. Its various types of pastas, sauces, ketchup, and olive oil literally makes Italy come to our dining table. 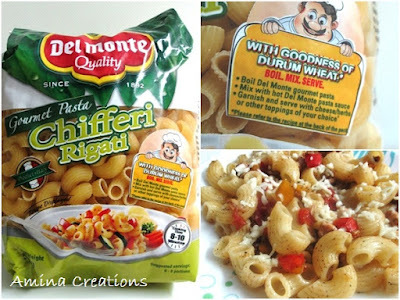 We often prepare Italian pasta at home and always turn to Del Monte Olive oil, olives, corn and pastas for preparing it. 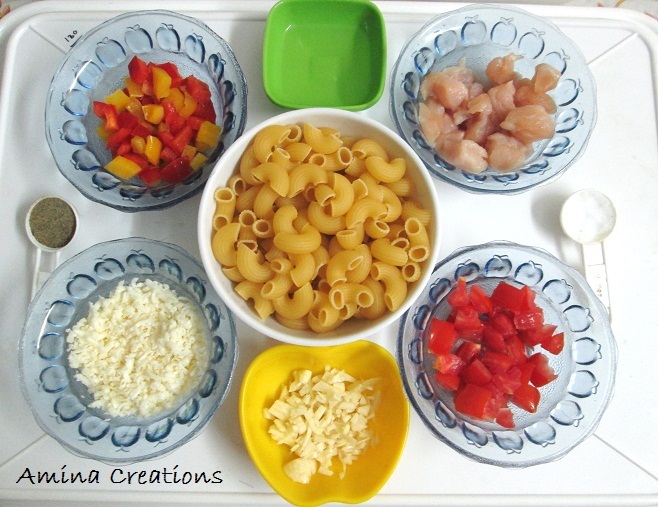 Today I would like to share my recipe of Chifferi Rigati with Chicken and tomatoes which is my family’s favourite pasta dish. This is so simple to make and with ingredients that are easily available in our kitchen. 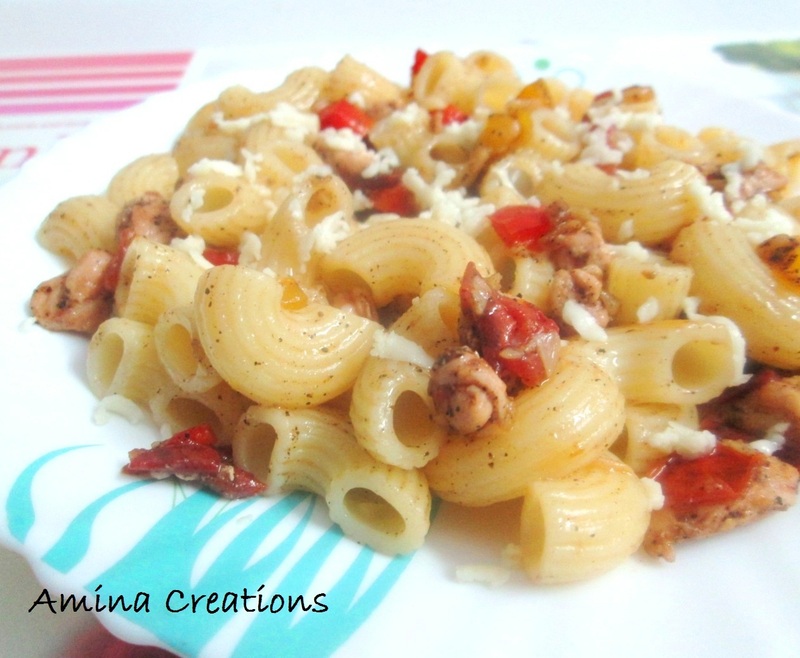 A fuss free recipe that can be cooked with just a few ingredients and tastes awesome!!! Take 1 litre of water in a large pan and bring to a boil. Add 1 tsp salt and the pasta into it and cook for about 12 minutes while stirring in between. While the pasta is getting cooked, we can prepare the sauce. 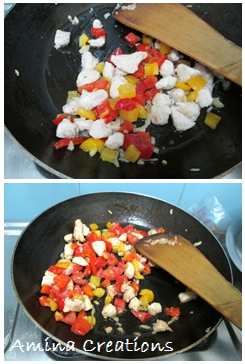 Finely chop the garlic cloves and cut the red and yellow bell peppers into small squares. Cut the boneless chicken into small cubes, and grate the cheese. De seed the tomatoes and cut into small squares. Once everything is ready, heat olive oil in a non stick pan and add the finely chopped garlic. Reduce heat to medium and saute for a few seconds till the raw smell goes. Now add the bell peppers and saute for a minute. Season with salt and pepper powder and mix well. Your pasta sauce is now ready. By this time the pasta would have cooked. 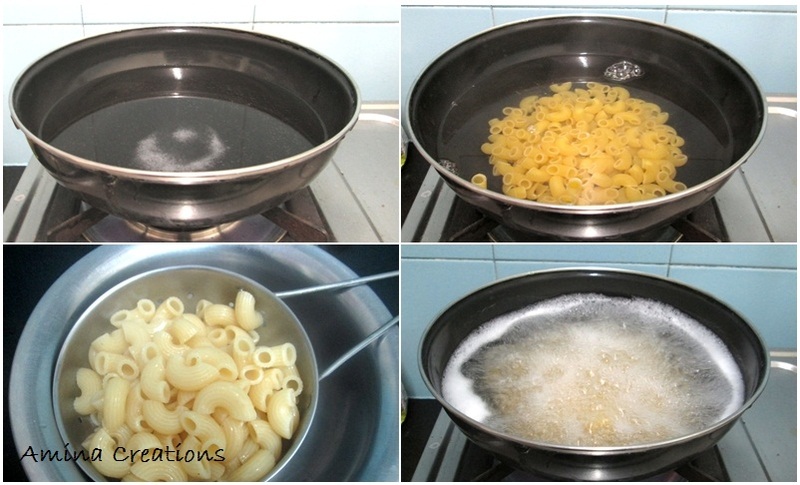 Drain the water from the pasta using a strainer and add the pasta to the sauce. Sprinkle cheese on top and wait till it melts. Switch off the gas, transfer to plates, and garnish with some more cheese. Take 1 litre of water in a large pan and bring to a boil. Add 1 tsp salt and the pasta into it and cook for about 12 minutes while stirring in between. 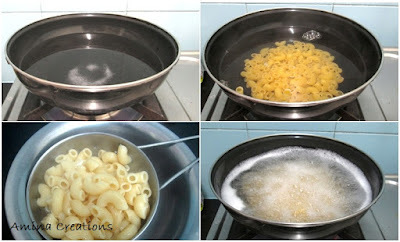 Once the pasta is cooked but still has a bite, drain away the water using a strainer and keep ready. 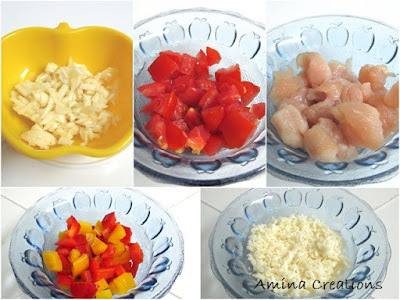 Finely chop the garlic cloves and cut the red and yellow bell peppers into small squares. 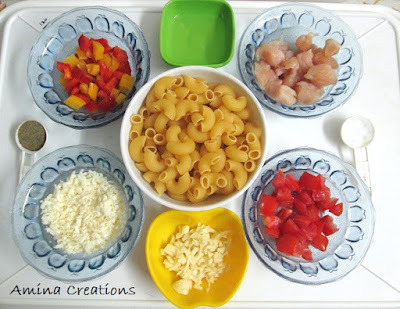 Cut the boneless chicken and tomatoes into small cubes, and grate the cheese. Now add the bell peppers and cook for a minute.Next add tomatoes and cook till they turn soft. Season the sauce with salt and pepper powder and mix well. Check for taste and add salt or pepper powder if necessary. Your pasta sauce is now ready. Now reduce heat to low and add the cooked pasta to the sauce. Toss well so that they are well mixed. Sprinkle cheese on top and when it starts melting switch off the gas. Transfer to the pasta to plates, garnish with some more cheese and serve hot. Do not over cook the pasta. Cook till it is soft but has a bite. You can also add oregano and thyme to add more flavour and taste to the pasta. 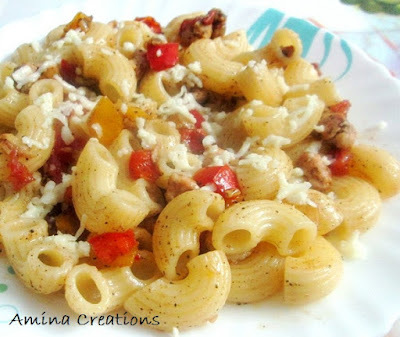 This recipe and post is my entry for the Del Monte's #Italian Escapades "Blog your way to Italy" contest hosted by Indiblogger.